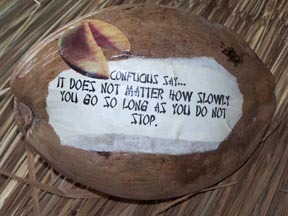 Confucius say...best fortunes come with coconut. Today's fortune: Person who sends message on coconut will live long and prosperous life. Send a novelty gift and unique message with a Fortune Coconut. Choose a fortune or write your own! We print your personal fortune on the coconut. Within 3 to 4 days, we mail your coconut and within a week, the recipient opens their mailbox to find a coconut! Check out the fortunes below. When you find one you like, copy it and paste it on the next page. You will obtain your goal if you maintain your course. Don't worry about money; the best things in life are free. 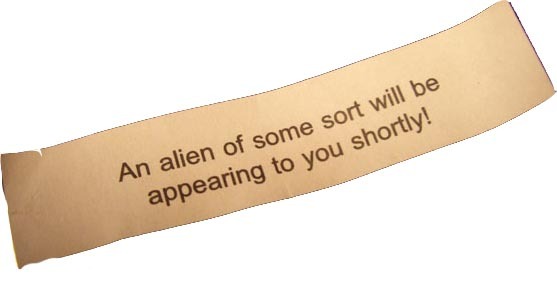 An alien of some sort will appear to you shortly. You will receive a fortune coconut. Confucius say you have a heart as big as Texas. Because of your melodic nature, the moonlight never misses an appointment. Someone will invite you to a Karaoke party. There is no mistake so great as that of always being right. A tub and a rub will change your day. You will start a journey today. Someone will reveal honest feelings to you. Stop sitting on the fence. The one you need to meet is looking for you. Remember compliments but forget the slights. You will make a trip soon. A stranger will brighten your day. You must meet someone new. Share your energy with those who are in the same boat. Think twice about making that decision. There are no endings, just new beginnings. Good advice will be given to you. Don't ignore it. Your secret admirer will soon appear. A vacation by the sea is in store for you. Someone is speaking well of you. This is a good time to start something new. You should be able to undertake and accomplish anything. You will get another chance. Don't waste it. Someone will invite you to a party. Love will be found from a past meeting. Everyone is perfect until you discover flaws. Don't forget, you are always on our minds. You will receive an important invitation. The road to knowledge begins with the turn of a page. An old friend is missing you. After a few drinks, people tend to tell the truth. Joys are often the shadows cast by sorrows.It's time to try a new look. It's called a break-up because it's broken. Behind an able man, there are always other able men. Someone has to be first. Might as well be you. Try to value useful qualities in one who loves you. Your heart is a place to draw true happiness. Lady luck rewards those who work hard. You are surrounded by fortune hunters. You are more likely to give than give in. A wise person will give you timely advice. A thrilling time is in your immediate future. Confucius say, one who lives happy lives long. I see many long and happy years ahead. You will eat a lot more cake in your lifetime. he longer you live, the more shoes you get to buy. The longer you live, the more taxes you get to pay. The longer you live, the more joy you bring to the world. The longer you live, the more likely it is that your children will move back home. Confucius say, sunny skies ahead. Health, wealth and happiness are in your future. You will live a long and healthy life. One needs the rain for the rainbow to appear.Love keeps you healthy. Love and laughter are the best medicine. Your life brings joy to another person. You are the sun that brightens another's world. Your eyes are mirrors to another's soul. You are the flame that burns another's candle. Your joy runneth over into another's cup. You are the beating in another's heart. Your love will endure for a lifetime. Someone somewhere loves you more than any other. You are the sun and the moon in another's sky. You will find love in unexpected places, like a coconut. Love is knocking on your door. Don't be afraid to open it. You are destined to be happy in marriage. Senders of coconuts make good mates. You will be visited by an alien soon. You can color your hair, but not your heart. You will ride a unicycle in a circus. A clown named Bozo will teach you an important life's lesson. You will be plagued by thoughts of empty mini-bars. It is easier to collect shoes than friends. Don't climb on the roof. Bumpy roads ahead, wear a helmet. When you find one you like, copy it and paste it on the next page.